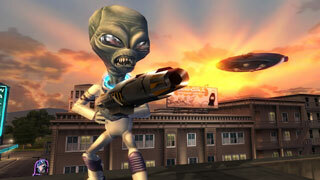 It sounds like Nordic Games may be planning to do something with the Destroy All Humans IP soon. Back in 2013, the IP owned by THQ was auctioned off to the highest bidder, and Nordic Games came out of that auction with a lot of recognizable franchises in their control. One of those franchises was Destroy All Humans. The Pandemic-developed sci-fi alien spoof was good for four games before THQ went under, and since then, gamers have been asking when they might see it return. Last year, Nordic said that they were, "Thinking about what to do with it." Over the weekend, Nordic Games Product Development Director and Executive Producer Reinhard Pollice said on Twitter that the company might be closer to working on game. He wrote, "There are a few options we are evaluating now. Hope to get started on one of these soon." What those "few options" are isn't elaborated on, but I can think of at least three distinct choices the company could have. First, they could simply re-release all the old games on Steam, PSN, and Xbox Live. Second, they could remaster one or all of the old games. Finally, they could make a whole new game in the series. Whatever route they take, it's likely that many gamers will be keeping an eye on their progress.